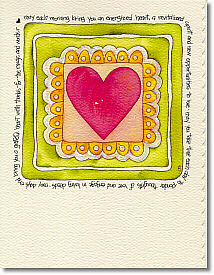 INSIDE MESSAGE: "May every day be filled with love. Happy Valentine's Day." WORD SURROUND: "May each morning bring you an energized heart, a revitalized spirit and new oportunities to love. May you take the time each day to ponder thoughts of love and engage in loving deeds. May day's end bring you a grateful heart with thanks for the magic and wonder."